In Ontario, car and truck accidents are a daily occurrence. They can be minor where you escape with surface abrasions which can be easily treated and rehabilitated or they can be tragic where lives are lost or disabilities are severe and permanent. Seriously injured car accident victims have multiple options for obtaining injury compensation: they may make a negligence claim for damages against the ‘at fault’ driver; and/or file an accident benefits claim with their insurer. Our experience in representing victims of motorcycle related accidents will help secure a favorable outcome if you were injured in a motorcycle collision. Motorcycle accidents often result in severe injuries including head and brain injury, road rash, and fractures to arms or legs. Obtaining favourable financial compensation permits accident victims to get needed medical treatment and focus on recovery without the financial burden that they would otherwise be carrying. Cyclists and motorists, on average, share the blame in cycling accidents, which often result in serious injury or death for the cyclist who is far more vulnerable in a collision. Many cyclist-motorist accidents occur when drivers do not properly watch out for cyclists when turning at intersections, before opening their doors or when they are passing. The Making Ontario’s Roads Safer Act has introduced regulations aimed at both cyclists and motorists with the objective of reducing injuries and deaths from cycling collisions. When a car hits a pedestrian the driver will generally be held liable for injuries to the pedestrian if the pedestrian was obeying the law. Driver carelessness or errors contribute to mos pedestrian accidents and fatalities, which in many cases occur after a driver committed a driving infraction. Pedestrians often suffer severe and permanent injury, such as brain injury, spinal injury and fractures in these life-altering incidents. Premises liability refers to a property owner’s obligation to keep people safe while they are on a premises. If a hazard or unsafe condition results in serious injury, the injured person can make a claim for damages against the owner or occupier of a property. Municipalities, businesses, homeowners and industries may be held liable for injuries that result when they failed to take reasonable care, for example, to clean up spills, fix a damaged floor surface or remove debris. Slip and fall accidents, car accidents and recreational accidents don’t always result from a careless act on the part of the accident victim. Sometimes a failure to maintain a safe environment or repair an unsafe condition, such as a damaged sidewalk, unsafe recreational facility or an icy road, can cause injuries to the public. Municipal liability and negligence may be proven when serious injury results from a dangerous circumstance on municipal property. It is not uncommon for people to be overwhelmed after being injured, both with the challenges of recovering from their physical injuries and with the process of applying for owed accident benefits. To add to the stress, there are substantial requirements for medical evidence and assessments before you are approved for benefits. ILO accident benefits lawyers can offer expert advice and help with the legal formalities involved in an application for Car Accident Benefits and will represent you if benefits are terminated or denied. 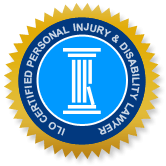 Catastrophic injuries include severe injuries to the brain or spinal cord, or the loss of limbs or eyesight, and they typically result from violent trauma in an accident. Accident victims who experienced a catastrophic injury may suffer severe symptoms such as complete or partial paralysis, and Ontario law recognizes that catastrophically injured persons deserve and are entitled to significantly greater financial compensation in a negligence suit or accident benefits claim than people who sustain minor injuries. Product liability law focuses on product defect (the physical state of the product) and negligence (the Manufacturer’s conduct pertaining to production). Under Canadian law, sellers, distributors, importers and manufacturers have a legal obligation to report defects that have a reasonable potential to result in serious injury or death for consumers. Proving negligence in a claim for compensation requires proving fault in product design, identifying a link between the defect and injury and assessing whether the risk of injury was foreseeable by the manufacturer or industry. Brain injuries can be temporary or permanent, but are far more common than most Canadians realize. Traumatic brain injury resulting from car accidents and slip, trip and fall accidents is the leading cause of permanent disability or death for young Canadians, and most victims are not able to return to work. Prompt medical treatment and ongoing care, family member support, community services, and financial compensation for loss of income and rehabilitation treatments all play a vital role in care and recovery for the injured person. When an accident victim suffers spinal cord injury, their symptoms may range from ongoing pain or numbness to paralysis. Most spinal cord injuries are caused by severe trauma to the back or neck occurring in a car accident. A catastrophic spinal injury has a devastating impact on the lives of accident victims and their families, and injured persons require significant physical therapy and treatment to help with pain and mobility. Accident victims deserve zealous legal representation to ensure optimal compensation for the expenses arising from their challenges. Disability benefits are a form of income replacement that is offered to individuals who are not able to work due to illness or physical or mental disability. If you are disabled, the process of applying for your benefits can seem arduous and lengthy. We offer a free consultation to assess your case and inform you of the options that are available to you. There is nothing funny about slip, trip and fall accidents, which commonly cause serious injury to Canadians of every age. Slip, trip and fall accidents sometimes result from carelessness on behalf of the person who fell, such as when inappropriate footwear is worn on icy sidewalks. However, these accidents also often result from unsafe conditions and property owner negligence, from spills that were not cleaned, broken flooring, loose carpeting, poor lighting, broken handrails and other hazards. Wrongful death claims generally arise when the reckless or negligent actions of an individual directly results in the death of a family member. When you are devastated by the sudden loss of a loved one, often the last thing on your mind is filing a wrongful death claim. ILO lawyers have helped many families during the difficult time after losing a loved one in a wrongful death accident, and our goal is to make this process as stress-free as possible for you. Call us for a free initial consultation to get honest advice on your rights, the grounds for filing, who is eligible to file and any other questions you may have. In Canada, recreational accidents may occur in a wide variety of activities, including skiing, boating, swimming, cycling, snowmobiling, ATV’s and organized sports. Most recreational activities have an element of risk that is known to participants. Skiers understand that they may lose control on a mogul and soccer players anticipate colliding with other players. However, when serious injuries result from an unsafe circumstance that’s not an expected aspect of the sport or activity, then the person or owner responsible for the hazard may be held liable for your injuries. Due to their sheer size and momentum, when a car or pedestrian is struck by a bus or train, injuries are likely to be severe. Even the passengers of busses and trains may be seriously injured in the event of a crash, and the lack of restraints in these vehicles can cause occupants to be violently thrown around. Victims of public transit, bus and train accidents may claim for damages against the operator of the bus, train, municipality and/or the responsible driver, if there was negligence on behalf of the driver or the municipality.